It's easy to forget that the most important thing, when young children are just starting to write, is to keep things fun. Personally, if I didn't love writing, I'd have given up years ago. Writing has always been a safe space, a place where I could feel a sense of control over the world, or just escape into another alternative 'made up' world for a while. Writing is a continual adventure in which I discover new things about myself and the world. Why should I not want the same for my child as she begins to write? Learning to write can so easily become a source of anxiety about 'getting it right.' I think that we need to give young children the kinds of writing projects that they truly enjoy as well as projects that enable them to make choices about what they write and how they express themselves. We need to help them to experience themselves as writers of their own lives. I have learned so much from my almost-six-year-old about writing and making. She reminds me every day that it's much too easy to get lost in doing things 'right' and just how much we need to make mistakes in order to develop. I hear myself saying things to my daughter such as: 'You can't always get it right on the first try,' and 'Never mind. How could you do that differently?' and all this helps me to remember that I really need to do more of that in my own life and writing. At the weekend, we sat down to make some secret love notes together that she will hand out to her class and teachers after the half-term holidays. In my experience, small children love anything that is 'secret.' And they also love anything that is tiny or just pocket-sized. 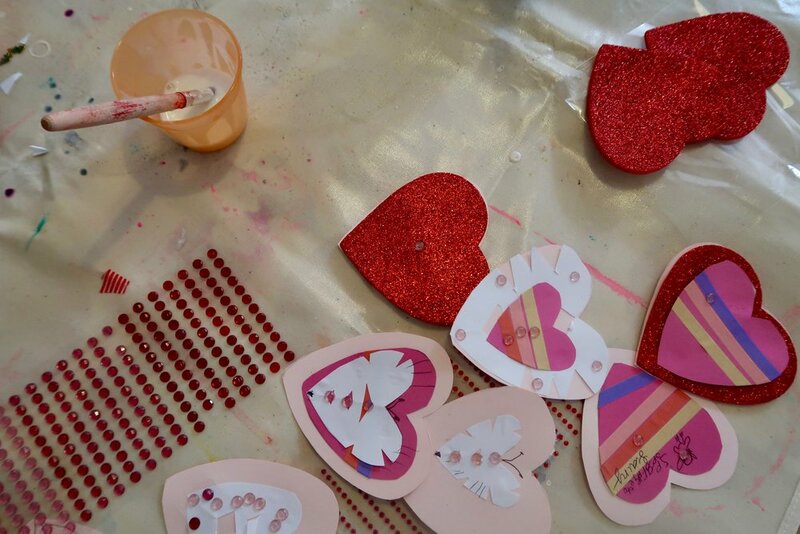 We experimented with lots of different ideas and I loved that the Valentine butterflies were entirely V's own idea, the result of making paper 'snowflake' hearts, which she thought looked like wings. She immediately wanted to write little notes - on both the front and the back of the cards - as we went. In fact, writing these personal messages seemed to be the element of the project that she most enjoyed. She put a great deal of care into composing the messages and asked me about lots of new vocabulary. This was such a simple shared project and we both learned so much. If only I had more time this week, I'd love to organise a Valentine 'poetry bombing' session with my students where we all released little notes with lines of favourite poems or writing prompts around campus and the town. Wouldn't that be a brilliant starting point for thinking about writing as social change? Don't we all need a bit more love in our lives in these times? But for now, I'll just have to be satisfied with 'love bombing' my own small corner of the internet with these butterfly hearts. I'm a few months into the process of thinking further about the way that we use learning journals and reflective writing in HE, so I thought that I might try to capture some of my key thoughts so far here. This is the first in a series of three blog posts. Learning journals and what are often called 'critical-reflective commentaries' have always been central to my practice in teaching creative writing; but it's only relatively recently that I began to think about the ways that approaches and tools that are regularly used and developed in my own discipline might be useful to staff and students working across other fields. This next step on my journey began when a wonderful colleague at Teesside, Jo Irving-Walton, asked me to share some ideas with staff working on our PGCE training programmes, where learning journals are a key part of assessment. You can download some of the handouts to these sessions in the Resources area. It was very inspiring to work with such an enthusiastic and keen bunch of people - and I started to talk with Jo about how learning journals are used across the HE sector and how we might identify and disseminate best practice. It seems that learning journals have become a trend. They have popped up all over the place across a range of courses and modules. But how exactly are they being used? Do we really understand enough about how, when and with which groups of learners they are most effective - and also about when and how not to use them? At Teesside, Jo and I have now begun an informal information gathering and sharing exercise with colleagues, as part of a Grand Challenge Learning for the 21st Century research project. A group of staff have met a couple of times now to talk about our practices and to do some reflective writing together. We also have a Level 5 student working with us this semester as part of our Students as Researchers scheme. He will design and carry out five in-depth interviews with staff across the University who are currently using learning journals in varied ways, whilst also keeping a learning journal himself. I'm looking forward to finding out more about what this yields. Observation 1: It's essential to distinguish between private, process-based writing and shared, assessed writing. Asking students to keep a learning journal and then submit it - or a part of it - for assessment will probably result in one of two outcomes. They will either feel too intimidated to keep the journal at all - and then complete it retrospectively, just to meet the requirements of the assessment, producing a sort of 'fake' journal in which they tell the tutor what they think s/he wants to hear. Or they will studiously write in their journal but will not feel sufficiently free to truly interrogate and reflect on their own learning experiences. As they will already be crafting something that is designed to be read and assessed, their 'reflections' will inevitably be shaped by that and they will miss out on some valuable opportunities for private learning and insight. Therefore, the first and perhaps most important stage in working with learning journals is to make a very clear distinction for students between process and final assessed product. We need to let students know that their learning journal is a private space, just for them. We need to give students the tools, techniques and creative approaches to get the most out of this private space, as a place of real experimentation with no required outcome. Some handouts for this are available under Resources on this site. We need to explain to students that, at the end of this first stage of private experimentation and reflection, we will give them guidance about how to select, shape and write on or about this private writing, in ways that feel safe - and that only this final piece of work will be assessed. Although it is possible to argue that the implied reader - the person we write to or for - is always present, even in a private journal, private journal writing is not writing 'out loud' and therefore does not involve the same anxieties about being read. Indeed, if we keep the learning journal an essentially private space, much creative work can be done to encourage students to experiment with developing this sense of themselves as a supportive reader of their own learning experiences. Celia Hunt has a fantastic guided visualisation for creating an 'ideal reader' in her chapter on 'The Reader' in Writing: Self and reflexivity, Hunt and Sampson. 2006. So the more that we can encourage students to embrace a safe, private space for their own unmediated writing, the more we are encouraging them to immerse themselves in a learning process that is primarily for and about them. We're encouraging them to set up a space for themselves in which they can write reflexively about what their learning really feels like. When they are ready - and only then - they can edit, craft and share, discuss with their peers and perhaps write about this process of sharing too. By the time they shape something for assessment, they are much more likely to have engaged in a very rich process of reflective and reflexive learning. Have you ever used tarot or oracle cards as writing prompts? You may want to pick a card as a focus for a question that you have, or a problem that you're facing. You may want to 'ask the cards' about something that is bothering you or that you feel confused about. But if all that sounds much too quirky, you can just choose without any particular thought at all, spend some time looking at the image you've chosen and free write from there, without pausing or editing. This can also be a fun way to involve children. My little one loves to 'pick a card' for me and this often starts a great conversation about the imagery, ideas and feelings that the card holds for each of us. We love The Wild Unknown deck and I also really enjoy these oracle cards and also these. I highly recommend Little Red Tarot for a beautifully curated collection of inspiring cards. And I'm lusting after these. But I'd also love to make my own deck. Little Red Tarot has a post about that here. This is the first activity that my five-year-old daughter and I did together this summer holiday. I took my inspiration from this self-portrait project from the wonderful Artbarblog. But, of course, I added in some writing. I love the picture that my daughter produced - and she was delighted with it too - but what was most interesting to me about the activity was what emerged from the process. I started off by asking her to close her eyes and think about her imagination. I asked her: What does it feel like? What does it look like? What does it taste like? If you could hold it in your hand, what would that be like - heavy or light, soft or with edges...? I then encouraged her to start painting what this felt like, using a simple watercolour palette. I'd set up the activity on a tray. I was amazed at how easily she was able to translate the images and sensations in her mind onto the paper. She spent a very happy half an hour with the paints, experimenting with different strengths to represent the feelings and ideas, gluing the paper doily 'flower' and finding out what happened when she added paint to the doily or used pens over the wet watercolour. At a certain point, she decided that she wanted to stick her photo into the middle of the picture (she needed some help with cutting this out) and then she told me that she wanted to 'label' what she had drawn. Interestingly, I didn't have to suggest any writing, She did this very spontaneously. (My daughter loves writing at the moment. She can't get enough of it. However, if you're working with a child who is not as enthusiastic about making words, you could make notes of what they tell you as they're painting and then gently encourage them to incorporate some of the words. They may want to copy the spellings from your notes so it's a good idea to write them as clearly as you can. She chose to use another copy of the photo print on the cover and then coloured over it with glitter pens and embellished it with adhesive gems and stickers. I really love the writing that she made here and how it gave her the opportunity to practise forming sentences. What fascinates me most about this process is that it enacts two distinct phases from my research into creative writing processes. The painting is a lovely example of Letting Go with colours and textures, enjoying the words as feeling-objects in themselves; and then the book-making is a kind of crafting process, a perfect example of the phase that I call Making or Finding Form. And all exemplified very naturally by a five-year old. So interesting.